Five months ago, on 27 October, 2016 123 UN Member States voted for a resolution on multilateral nuclear disarmament that called for negotiations to commence on a "legally binding instrument to prohibit nuclear weapons, leading towards their total elimination". After the UN General Assembly overwhelmingly endorsed this resolution in December, the stage is set for nuclear ban treaty negotiations to commence on 27 March, with further sessions planned for June and July. The UK was one of only 35 states (mostly nuclear-armed and NATO allies) which voted against multilateral negotiations when the resolution was overwhelmingly adopted by the UN General Assembly in December 2016. That negative vote does not mean these states can't participate in this year's negotiations. Britain was invited to participate in preparatory organisational meetings at the UN in February, but chose not to attend. In response to a recent parliamentary question from Green Party MP Caroline Lucas, Sir Alan Duncan, Minister of State for Foreign and Commonwealth Affairs, announced its boycott, saying that “The UK did not participate in the organisational meeting on negotiating a treaty to prohibit nuclear weapons on 16 February and will not attend the substantive negotiations starting on 27 March." Nikki Haley, the Trump administration's newly appointed ambassador to the United Nations, is planning to stand outside the UN General Assembly hall to deliver a statement and protest to the media about the nuclear ban negotiations. The US is pressuring other NATO states to stand at her side, and it remains to be seen whether Britain's ambassador Matthew Rycroft will be there. Maybe they will hold hands, together with other boycotting countries such as Russia and North Korea! With Donald Trump in the White House and Vladimir Putin in the Kremlin, an international alliance of countries and civil society is seizing this year's unprecedented opportunity to ban all nuclear weapons and take them off hair trigger alert and out of circulation. 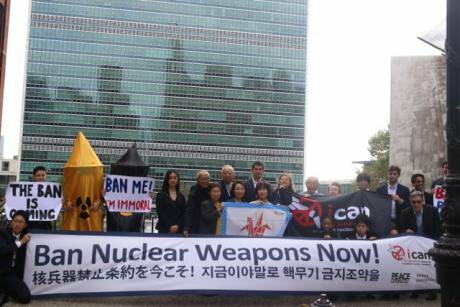 The rise in nuclear sabre rattling from Trump, Putin and Kim Jong-un clearly underscores the need for a global nuclear ban treaty to provide stronger tools and taboos to prevent the use of these catastrophic weapons of mass destruction. Instead of joining Trump and Putin in their boycott, Prime Minister May ought to welcome the opportunity to participate in UN humanitarian disarmament negotiations. According to a YouGov opinion poll released last week, 79% of UK residents who said they'd voted Conservative in the 2015 General Election agreed that the government should participate in the UN multilateral negotiations – the same proportion as those who voted Labour. The younger age brackets had more ‘don’t knows’, but still registered over 70% in favour of negotiating to prohibit nuclear weapons. Overall, 75% of the cross section of British adults whom YouGov had polled thought Britain should participate in the UN's nuclear disarmament talks . Only 9% thought the government should not attend, while 16% said they didn't know or were undecided. A nuclear ban treaty would remove the necessity Theresa May felt last July to proclaim that having Trident meant being prepared to launch it in the knowledge that this "could kill 100,000 innocent men, women and children", contrary to her Christian upbringing and the teachings of all major faiths. A nuclear abolition treaty under international humanitarian law would also help with several of May's other economic and political headaches. When broken down by geographical region, the highest support came from Scotland, where YouGov polling showed 82% in favour. This is unsurprising, as the UK's nuclear warheads are stockpiled at Coulport and deployed on submarines that are home-ported at Faslane, 35 miles from Glasgow. Opposition to nuclear weapons has long been a driving force in Scottish demands for independence. With Brexit to sort out and pay for, it would be good to claw back at least some if not all of the cost of Trident replacement, estimated between £179 billion (by Conservative MP Crispin Blunt) and £205 billion (by CND). We're going to need some of that taxpayers money for decommissioning and safely disposing of the existing nuclear submarines that carried Polaris and Trident missiles for the past fifty years. And if Brexit results in the UK's withdrawal from the Euratom Treaty, as some Tory MPs are demanding, we'll also need to find another way to ensure effective nuclear safety regulations are implemented. For decades, all Westminster parties have pledged support for multilateral nuclear disarmament, even if some have wrangled over the false dichotomy of unilateral versus multilateral that has stymied intelligent debate in Britain since the 1980s. Now that multilateral negotiations are actually taking place, Theresa May should make good the Conservative Party's oft-repeated commitments to this. The standard Foreign and Commonwealth Office (FCO) argument for the decision to boycott, which Sir Alan Duncan gave Caroline Lucas, was that the Conservative government "do not believe these negotiations will lead to effective progress on nuclear disarmament." This means the government has decided in advance that it isn't going to like the outcome. But the point about negotiations is to enter into a process to determine the best possible outcome. And you can't do that by refusing to participate. The FCO says that it prefers to continue pressing for a step-by-step process using "existing frameworks", citing the Geneva-based Conference on Disarmament (CD). A legally binding instrument to prohibit nuclear weapons has been overwhelmingly endorsed by the UN as the next step, and negotiations are being conducted in a similar framework to the one Britain advocated for the 2014 Arms Trade Treaty. By contrast, efforts to negotiate a fissile material treaty in the CD have failed, with no prospect of progress. The Geneva-based CD, which has only 66 member states, just a third of the UN's membership, has been blocked for two decades because various nuclear-armed states have upheld a "consensus rule" that every single one of the 66 member states must have a veto. Over the years since the Comprehensive Test Ban Treaty (CTBT) was concluded in 1996, Pakistan and the United States have successfully used their vetoes to prevent any relevant disarmament steps from happening. The point of this nuclear ban process is to get multilateral negotiations off the ground. To move beyond decades long deadlock in the CD, the UN decided that negotiations on a nuclear ban treaty should be held under different multilateral principles, whereby they are open to all 193 member states and conducted in accordance with rules of procedure that allow negotiations to move forward to decision-making without being blocked by any individual state or unrepresentative minority group. Of course, each UN Member State will continue to have the right to decide whether to join any agreement that is negotiated. Once this treaty takes legal effect, it will reinforce existing norms and the non-proliferation regime, laying the foundation for further legal and verification steps to be negotiated. Britain could have a lot to offer. In all likelyhood there will be more jobs in disarmament and verification than in Trident replacement. As soon as the UK is ready to accede, we will be able to put all the skills bound up in the UK's Atomic Weapons Establishment into dismantlement, verification and strengthening international efforts for peace and security. At the organisational meeting, which was attended by over 100 states, it was decided that Costa Rica's Ambassador Elayne Whyte would chair the negotiations. Delegates also agreed that the main issues to be covered in the first week, 27-31 March, would include the basic principles, objectives, preambular elements and core prohibitions and institutional arrangements for what most hope will be a universally applicable Nuclear Ban Treaty. Following this, Ambassador Whyte will no doubt produce a draft treaty text, which UN Members will negotiate in detail in June and July 2017 - with the hope of concluding this year. Though there will not be any formally instructed government diplomats to represent British interests, at least the Labour Party’s Shadow Minister for Peace and Disarmament, Fabian Hamilton, will be present, along with parliamentarians and civil society from Scotland and around the world. Many of these are partners in the International Campaign to Abolish Nuclear Weapons (ICAN), which comprises over 400 organisations in 100 countries, including nuclear-armed and NATO states as well as the non-nuclear countries that have taken the lead in the multilateral, humanitarian disarmament initiatives so far. I will be there with several hats, notably as ICAN's former co-chair and a current steering group member, and also as the Green Party's spokesperson for security, peace and defence. No-one is claiming that the nuclear ban treaty will achieve nuclear disarmament overnight. It is a vital step towards that goal, just as the CTBT was an important step in the 1990s. Other steps were stymied because everything could be vetoed by one or more of the nuclear armed states with a vested interest in nuclear business as usual. That is what is different now. We can't keep turning a blind eye to the costs and risks of nuclear weapons, and the persistent dangers of proliferation and modernisation. Nor should we let countries like the UK get away with hiding behind the deadlocked CD. Further disarmament steps, including on curbing the deadly fissile materials plutonium and uranium and on a WMD-free zone in the Middle East, are more likely to become possible once nuclear weapons are legally prohibited. Whether or not Britain joins, the nuclear ban treaty is likely to be concluded and to take effect in the next couple of years. Banned weapons become stigmatised, which greatly facilitates efforts to control and eliminate them. This treaty will have immediate impact on the high and counter-productive value and status currently attached to getting and having nuclear armaments. It's unacceptable and arrogant for some countries to refuse to participate unless everything is on their terms. The UN must negotiate to provide the best possible protections and security for everyone, not just for the most self-regarding or most heavily armed. While the UK undoubtedly has a right to be absent when others negotiate on issues of vital importance to British and international security, we must understand that those who wilfully remove themselves from the responsibilities of constructive multilateral decision-making can't complain about the outcomes.